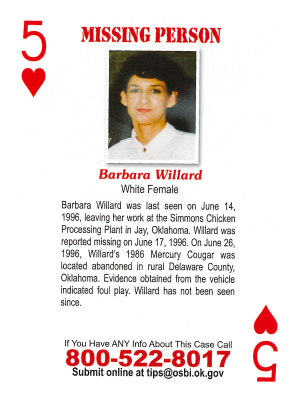 Barbara Willard was last seen on June 14, 1996 leaving her work at the Simmons Chicken Processing Plant in Jay, Oklahoma. Willard was reported missing on June 17, 1996. On June 26, 1996, Willard's 1986 Mercury Cougar was located abandoned in rural Delaware County, Oklahoma. Evidence obtained from the vehicle indicated foul play. Willard has not been seen since.